The latest Intel PC client platform roadmap has been leaked out which shows the launch schedules of several next generation processors from Intel. 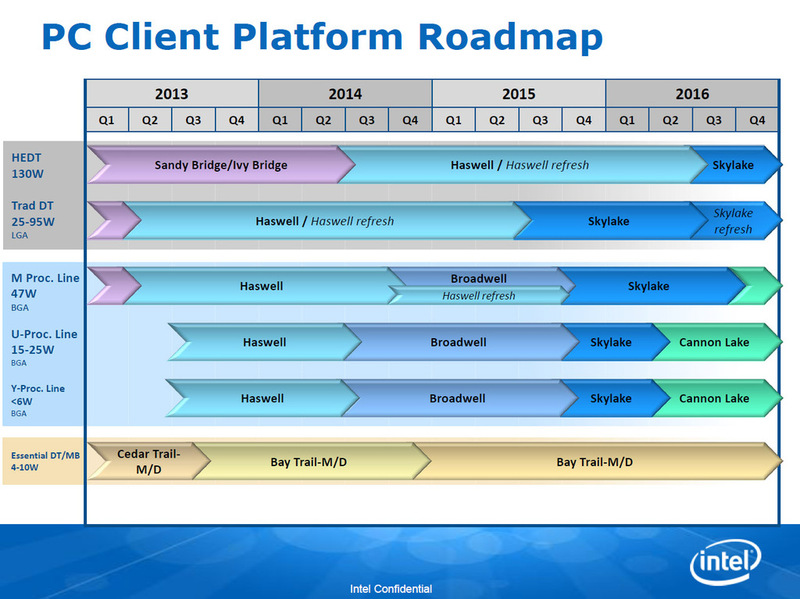 The 2013-2016 roadmap provides key insight on how Intel will handle launches of their next generation processors including Broadwell, Skylake and Cannonlake which are going to be based on 14nm and 10nm process designs. Starting off with some details, we know Intel is launching Broadwell in mid of June and will launch in five SKUs that include a mix of desktop socketed and BGA chips. The desktop socketed platform will include the Core i7-5775C and Core i5-5675C processors with Iris Pro graphics which we have talked about in brief detail over the last month. The Broadwell M, Y, Y lineups have already launched previously and are soon going to be replaced by Intel’s 6th generation processors but first we will talk about the desktop platform which gets updated in the next few months after Broadwell. Some key features of the Skylake generation of processors is t hat they will feature new IA CPU and graphics microarchitecture based upon the 14nm process. The TDPs will range from 95W on the enthusiasts chips all the way down to 65W mainstream and 35W low TDP chips. Skylake is going to leverage the performance not only on processor side through core evolution, but also going to feature a new graphics core with key improvements that push performance by 50% on the fastest GT4e graphics chips and reducing the overall power consumption by 60%. These are some major enhancements and one can expect Skylake to be a big game changer for Intel after several years of stagnant IPC increases on the previous processor releases. What’s more surprising is that Intel will also have a Skylake refresh platform in Q3 2016, a year after the initial Skylake platform which will come out with new processors. No details are known but the new chips will come with faster clock speeds and probably even a “Devil’s Canyon” type lineup. Intel will steadily keep on releasing chips for their M, U and Y series platforms with the transition to Broadwell complete and the next phase to be initiated from Q4 2015 when the lineups based on Skylake processors are going to launch. Soon after Skylake, Intel plans to release their first 10nm chips based on the Cannonlake x86 core architecture in Q2 2016 with a huge emphasis on the yearly notebook updates. Featuring an updated and power efficient design, Cannonlake is a step closer to extremely low power chips which can do wonders to mobile platforms. The mobile MQ series will launch in Q3 2016 for more performance intensive notebook designs. It goes off to show that Intel will at least have 10nm chips available to consumers by next year how ever, the desktop parts won’t see the light of day till 2017. Intel’s roadmap also gives a update on their High-End desktop platforms. We know from past reports that Intel is launching Broadwell-E in Q1 2016 which will be support by the current X99 chipset based motherboards that feature the LGA 2011-3 socket. The next update arrives in the form of Skylake-E that will launch in Q3 2016. No details are provided but it is expected that the platform will issue a new series of chipsets and a different socket layout as compared to X99.